An editorial in the NY Times this morning reminded me that Google is making some interesting data available about user created content, censorship and Geography on the Internet, namely Google's Transparency Project. It includes both data on government requests to censor and traffic flows by country. The direct requests to censor is a difficult variable to understand (i.e., not well specified, see the FAQ) but the traffic data reveals some really interesting patterns. One of the most striking examples of censorship relates to Youtube which is also clearly tied to user generated content (of great interest to Floatingsheep). Using the Google interface one can see how access to this stream of user content has been restricted over time and space. Some of the more striking examples are below (or play with the data yourself). Given Canada's strong protection for personal liberty it is a good comparison to other countries. Note: all countries have some variation likely tied to normal congestion/outages on the Internet. The key is to look for big changes (i.e., drops) in the level of access. You can also compare the general level of access to Youtube between countries, e.g., compare Canada to Cuba. Cyberscape, or the cloud of geo-coded information through which we move everyday (handy visualization of cyberscape here). Digiplace, or the sorting of cyberscapes, often by software algorithms such as Google’s pagerank, to filter content and avoid information overload. A key part of digiplace is how it makes some parts of the cyberscape more visible while peripheralizing other areas. We’ve never had a good visualization of digiplace…at least until now. But Taylor’s recent search (via his iPhone) on Google Maps for the keyword "Kroger grocery" resulted in a nice example. In the image below, Kroger’s is in the upper left and is marked by a red push pin. Interestingly, Meijer's, another grocery store chain, also shows up as a sponsored link. Digiplace in action. While Google Maps does clearly label Meijer’s as a “sponsored link”, i.e., "paid for placement”, the digiplace produced by this search does change visibility within the retail landscape. Zook, M. and M. Graham. 2007. 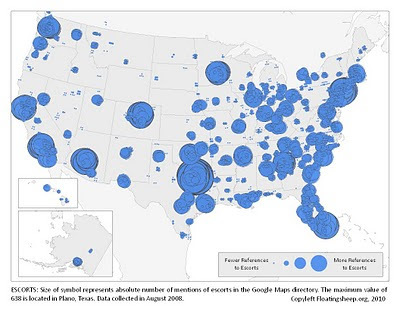 Mapping DigiPlace: Geo-coded Internet Data and the Perception of Place. Environment and Planning B 34(3): 466-482. 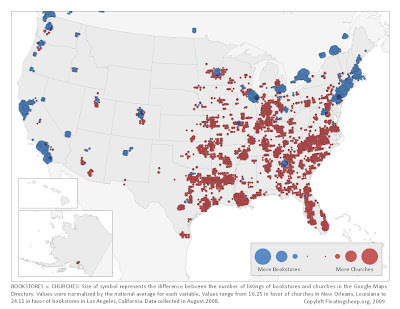 Bitterness aside, a very fresh and revised version of our map depicting the prevalence of abortion providers and abortion alternatives has been published in a new book, Mapping America: Exploring the Continent by Fritz Kessler. Thanks to Martin Dodge for taking a picture of our appearance in the book and alerting some of us to its existence for the first time. As we explored in an earlier post there are some interesting correlations (at the state level) between the number of references to beer and Christianity in the geoweb relative to obesity. (Recap: while it looks like Christianity is causing obesity it really a matter of income). We're starting to look deeper at the interrelation of content on the geoweb but before we do, we thought we finally post a couple more obesity correlations. And to reiterate, the obesity data is coming from the CDC, not us. This time around we compared the relative frequency of geoweb references to "feminist" and "gay" to the offline level of obesity at the state level. As the two graphs below demonstrate, states with more references to these two topics are less obese. Again, per capita income is likely an important (albeit not the only) factor in shaping these variables. It is, however, interesting to look at the outliers from the general trend, e.g., Colorado in particular. Although it has the lowest level of obesity in any of the states, the relative number of references to "gay" and "feminist" in its cyberscape is much lower than states with similar obesity. In other words, to fit into the overall norm of U.S. states, Coloradans need to either (1) gain a lot more weight or (2) start using the terms "gay" and "feminist" more. Food (pun intended) for thought. Stay tuned as we belly up for some falafel, wine and shepherd's pie. Based on Google Analytics here are the 6th through 10th most popular posts....We'll stop there. Enjoy them again or for the first time...click on the maps to see the original post. #7 Baptists, bibliophiles, and bibles, Oh My! #9 Mapping Escorts or What's Up with Plano, TX? In addition to blog postings we have written a number of academic papers which form the Floatingsheep Working Paper Series. Email us if the links don't work for you. Graham, M. 2010. Neogeography and the Palimpsests of Place. 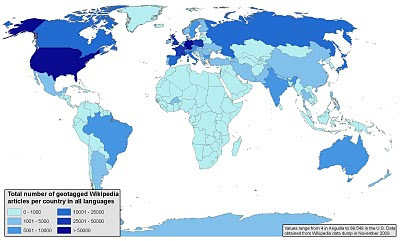 Tijdschrift voor Economische en Sociale Geografie 101(4): 422–436. Zook, M. and M. Graham. 2010. The virtual ‘bible belt’. Environment and Planning A 42(4): 763-764.